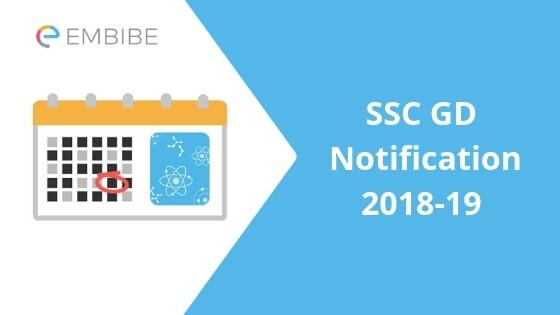 SSC GD Notification 2018-19 | As per the official notification released by SSC, the SSC GD exam will be organized into the online mode. The exam will begin on February 11, 2019, and end on March 11, 2019. The exam will be conducted for the posts like Constable (GD) in CAPFs, NIA, SSF, and Rifleman (GD) in Assam Rifles. SSC has announced the official SSC GD Exam Date Notification 2018-19 for the recruitment of 54,953 SSC GD Constables. There are total 47,307 seats for male and 7646 seats for female candidates. As the online registration is over so now candidates should focus on giving their best during the exams. Aspirants must go through the SSC GD Notification thoroughly to be aware of any latest update. Then they must start their SSC GD preparation. SSC GD exam is a highly competitive exam and cracking this exam needs one to be highly serious and methodical. In this article, we will provide you with the detailed SSC GD Notification. Read on to find out. Go to the SSC official website: ssc.nic.in. Make the necessary changes and save your application form. Note that the last date to make corrections is 18th October 2018. After that, no request to make corrections will be allowed. The SSC GD Constable eligibility criteria are tabulated below. Candidates who fulfill the SSC GD eligibility criteria can apply online for the exam. Follow the steps as under to fill up the SSC GD application form. Step 1 Login to SSC official website: ssc.nic.in. Step 2 Go to the “Apply” tab. Step 3 Click on the link to apply for SSC GD Constable. Step 4 Fill up the SSC GD application form – personal, educational and contact details. Upload the scanned copies of your photograph and signature in the required format and size. Step 5 Upload the scanned copies of your photograph and signature in the required format and size. Step 6 Make payment of SSC GD application fee. Step 7 Submit your application and take a print out of your online application form for future reference. SSC GD 2018 admit card is issued on the official website two weeks before the exam. Candidates have to enter their Registration Number (generated during filling up the online application form) and Date of Birth to log in and download their SSC GD Constable admit card. As you can see from the SSC GD Notification, the exam pattern and syllabus of SSC GD online exam are almost similar to the exams for other government jobs. So, you can take banking mock tests during your SSC GD preparation. At Embibe, you can take bank mock tests for free which will be of great help to you and will give a real feel of the actual exam. We hope this detailed article on SSC GD Notification 2018-19 helps you. If you have any confusion regarding SSC GD Notification, drop a comment below and we will get back to you. Hey Yadav, How can i help you?